I wanted to follow up with you quickly about your piece today about Citigroup. 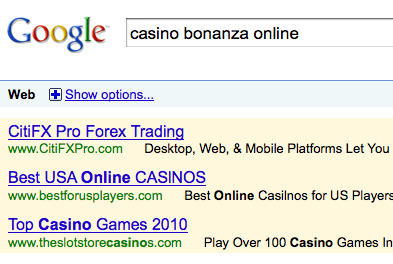 I wanted to let you know that CitiFX did not advertise on any keywords related to ‘casino’ using Google AdWords. The error has since been fixed. Original post: In the course of getting to know the online forex landscape, we came across the following. That’s right. When you do a search for “Casino Bonanza Online” you get two ads for online casino-based sites, but the very first is an add for CitiFXPro.com, which is, yes, a retail Forex trading site run by Citi. Now, it’s not really shocking that a multi-headed behemoth as big as Citigroup (C) has a retail Forex site, but here they’re specifically advertising against gambling-related terms, and showing up right next to Best USA Online CASINOS. Major Wall Street firms are frequently likened to casinos, but they’re usually not this blatant about it, and usually their services are geared towards sophisticated, institutional investors. But CitiFXPro.com is pure retail, requiring only $10,000 to open an account. That’s not non-trivial, but it’s way less than the threshold for anything that would be regarded as institutional. That’s right. they’re specifically advertising that since they’re bolted onto some good old fashioned retail banks, they’re FDIC insured (which is obviously something that your typical Forex online bucketshop could not argue). So they’re blatantly going for the gambling crowd, and they’re proudly highlighting their back fat taxpayer backstop. Lovely.